The Asuka period (飛鳥時代, Asuka jidai) was a period in the history of Japan lasting from 538 to 710 (or 592 to 645), although its beginning could be said to overlap with the preceding Kofun period. The Yamato polity evolved greatly during the Asuka period, which is named after the Asuka region, about 25 km south of the modern city of Nara. The Asuka period is known for its significant artistic, social, and political transformations, having their origins in the late Kofun period but largely affected by the arrival of Buddhism from China. The introduction of Buddhism marked a change in Japanese society. The Asuka period is also distinguished by the change in the name of the country from Wa (倭) to Nihon (日本). Artistically, the period can be further divided into two periods: the Asuka period (up to the Taika Reforms), when early Buddhist cultural imports and influences from Northern Wei are prevalent; and the Hakuhō period (after the Taika Reform), in which more Sui and Tang influences appear. The term "Asuka period" was first used to describe a period in the history of Japanese fine-arts and architecture. It was proposed by fine-arts scholars Sekino Tadasu (関野貞) and Okakura Kakuzō around 1900. Sekino dated the Asuka period as ending with the Taika Reform of 646. Okakura, however, saw it as ending with the transfer of the capital to the Heijō Palace of Nara. Although historians generally use Okakura's dating, many historians of art and architecture prefer Sekino's dating and use the term "Hakuhō period (白鳳時代)" to refer to the successive period. The Yamato polity was distinguished by powerful great clans or extended families, including their dependents. Each clan was headed by a patriarch who performed sacred rites for the clan's kami to ensure the long-term welfare of the clan. Clan members were the High Nobility, and the Imperial line that controlled the Yamato polity was at its pinnacle. The Asuka period, as a sub-division of the Yamato period (大和時代, Yamato-jidai), is the first time in Japanese history when the Emperor of Japan ruled relatively uncontested from modern-day Nara Prefecture, then known as Yamato Province. The Yamato polity was concentrated in the Asuka region and exercised power over clans in Kyūshū and Honshū, bestowing titles, some hereditary, on clan chieftains. The Yamato name became synonymous with all of Japan as the Yamato rulers suppressed other clans and acquired agricultural lands. Based on Chinese models (including the adoption of the Chinese written language), they developed a central administration and an imperial court attended by subordinate clan chieftains but with no permanent capital. By the mid-seventh century, the agricultural lands had grown to a substantial public domain, subject to central policy. The basic administrative unit of the Gokishichidō (五畿七道, "five cities, seven roads") system was the county, and society was organized into occupation groups. Most people were farmers; others were fishers, weavers, potters, artisans, armorers, and ritual specialists. The Daibutsu at the Asuka-dera in Asuka, the oldest known sculpture of Buddha in Japan with an exact known date of manufacture, 609 AD; the sculpture was made by Kuratsukuri-no-Tori, son of a Korean immigrant. The Soga clan intermarried with the imperial family, and by 587 Soga no Umako, the Soga chieftain, was powerful enough to install his nephew as emperor and later to assassinate him and replace him with the Empress Suiko (r. 593–628). Suiko, the first of eight sovereign empresses, was merely a figurehead for Umako and Prince Regent Shōtoku Taishi (574–622). Shōtoku, recognized as a great intellectual of this period of reform, was a devout Buddhist and was well-read in Chinese literature. He was influenced by Confucian principles, including the Mandate of Heaven, which suggested that the sovereign ruled at the will of a supreme force. Under Shōtoku's direction, Confucian models of rank and etiquette were adopted, and his Seventeen-article constitution prescribed ways to bring harmony to a chaotic society in Confucian terms. In addition, Shōtoku adopted the Chinese calendar, developed a system of trade roads (the aforementioned Gokishichidō), built numerous Buddhist temples, had court chronicles compiled, sent students to China to study Buddhism and Confucianism, and sent Ono no Imoko to China as an emissary (遣隋使, Kenzuishi). Six official missions of envoys, priests, and students were sent to China in the seventh century. Some remained twenty years or more; many of those who returned became prominent reformers. The sending of such scholars to learn Chinese political systems showed significant change from envoys in the Kofun period, in which the five kings of Wa sent envoys for the approval of their domains. In a move greatly resented by the Chinese, Shōtoku sought equality with the Chinese emperor by sending official correspondence that was addressed, "From the Son of Heaven in the Land of the Rising Sun to the Son of Heaven of the Land of the Setting Sun." Some would argue that Shōtoku's bold step set a precedent: Japan never again accepted a "subordinate" status in its relations with China, except for Ashikaga Yoshimitsu, who accepted such a relationship with China in the 15th century. As a result, Japan in this period received no title from Chinese dynasties, while they did send tribute (有貢無封, yūkō mufū). From the Chinese point of view, the class or position of Japan was demoted from previous centuries in which the kings received titles. On the other hand, Japan loosened its political relationships with China and consequently established extraordinary cultural and intellectual relationships. 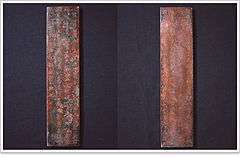 Left image: Copper epitaph of Funashi Ōgo (銅製船氏王後墓誌, ｄōsei funashi ōgo no boshi), who died in 641 AD and was reburied with his wife in 668 AD. The inscription of 162 characters tells on one side about his birthplace and career and on the opposite about his age at death and the burial details. About twenty years after the deaths of Shōtoku Taishi (in 622), Soga no Umako (in 626), and Empress Suiko (in 628), court intrigues over succession led to a palace coup in 645 against the Soga clan's monopolized control of the government. The revolt was led by Prince Naka no Ōe and Nakatomi no Kamatari, who seized control of the court from the Soga family and introduced the Taika Reform. The Japanese era corresponding to the years 645–649 was thus named Taika, referring to the Reform, and meaning "great change". The revolt leading to the Taika Reform is commonly called the Isshi Incident, referring to the Chinese zodiac year in which the coup took place, 645. Although it did not constitute a legal code, the Taika Reform mandated a series of reforms that established the ritsuryō system of social, fiscal, and administrative mechanisms of the seventh to tenth centuries. Ritsu (律) was a code of penal laws, while ryō (令) was an administrative code. Combined, the two terms came to describe a system of patrimonial rule based on an elaborate legal code that emerged from the Taika Reform. 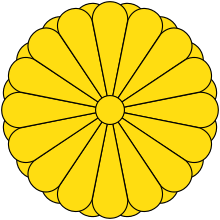 Naka no Ōe assumed the title of Crown Prince, and Kamatari was granted a new family name—Fujiwara—in recognition of his great service to the imperial family. Fujiwara no Kamatari became the first in a long line of court aristocrats. Another, long-lasting change was the use of the name Nihon (日本), or sometimes Dai Nippon (大日本, "Great Japan") in diplomatic documents and chronicles. In 662, following the reigns of Naka no Ōe's uncle and mother, Naka no Ōe assumed the throne as Emperor Tenji, taking the additional title Emperor of Japan. This new title was intended to improve the Yamato clan's image and to emphasize the divine origins of the imperial family in the hope of keeping it above political frays, such as those precipitated by the Soga clan. Within the imperial family, however, power struggles continued as the emperor's brother and son vied for the throne in the Jinshin War. The brother, who later reigned as Emperor Tenmu, consolidated Tenji's reforms and state power in the imperial court. The ritsuryō system was codified in several stages. The Ōmi Code, named after the provincial site of Emperor Tenji's court, was completed in about 668. Further codification took place with the promulgation by Empress Jitō in 689 of the Asuka Kiyomihara Code, named for the location of the late Emperor Temmu's court. The ritsuryō system was further consolidated and codified in 701 under the Taihō Code, which, except for a few modifications and being relegated to primarily ceremonial functions, remained in force until 1868. Though the ritsu of the code was adopted from the Chinese system, the ryō was arranged in a local style. Some scholars argue that it was to a certain extent based on Chinese models. The Taihō Code provided for Confucian-model penal provisions (light rather than harsh punishments) and Chinese-style central administration through the Jingi-kan (神祇官), which was devoted to Shinto and court rituals, and the Daijō-kan (太政官), with its eight ministries (for central administration, ceremonies, civil affairs, the imperial household, justice, military affairs, people's affairs, and the treasury). Although the Chinese-style civil service examination system was not adopted, the college office (大学寮, Daigaku Ryō) was founded for training future bureaucrats based on the Confucian classics. Tradition circumvented the system, however, as aristocratic birth continued to be the main qualification for higher position, and titles were soon hereditary again. The Taihō Code did not address the selection of the sovereign. Several empresses reigned from the fifth to the eighth centuries, but after 770 succession was restricted to males, usually from father to son, although sometimes from ruler to brother or uncle. Fujiwara no Fuhito, son of Nakatomi no Kamatari, was among those who produced the Taihō Ritsuryō. According to history book Shoku Nihongi (続日本紀), two of the 19 members of the committee drafting the Taihō Code were Chinese priests (Shoku Shugen and Satsu Koukaku). Chinese priests also took an active part as linguistic specialists, and received rewards two times from Empress Jitō. Chinese culture had been introduced to Japan by the Three Kingdoms of Korea before the imperial Japanese embassies to China were established. Although the missions continued, the transformation of Japan through Chinese influences declined, despite the close connections that had existed during the early Kofun period. Meanwhile, the countries of the Korean peninsula sent many presents to Japan, which helped lead to increased Japanese military support for Baekje. People also came to Japan from the Korean peninsula, including two high priests who arrived in Japan in 595: Eji from Goguryeo and Esō from Baekje. Kanroku also came from Goguryeo, and was a tutor to Prince Shōtoku, counseling him politically. When Japan allied with Baekje, the Goguryeo priests left Japan. The Yamato court, concentrated in the Asuka region, exercised power over clans in Kyushu and Honshu, bestowing titles, some hereditary, on clan chieftains. The Yamato name became synonymous with all of Japan as the Yamato rulers suppressed the clans and acquired agricultural lands. Based on Chinese models (including the adoption of the Chinese written language), they developed a central administration and an imperial court attended by subordinate clan chieftains but with no permanent capital. By the mid-seventh century, the agricultural lands had grown to a substantial public domain, subject to central policy. The basic administrative unit was the county, and society was organized into occupation groups. Most people were farmers; other were fishers, weavers, potters, artisans, armorers, and ritual specialists. From 600 to 659, Japan sent seven emissaries to Tang China. But for the next 32 years, during a period when Japan was formulating its laws based on Chinese texts, none were sent. Though Japan cut off diplomatic relations with China, Japan sent 11 emissaries to Silla, and Silla is also recorded in Nihon Shoki as sending embassies to Japan 17 times during the reigns of Emperor Tenmu and Empress Jitō. The ruling classes of Yamato and Baekje were on amicable terms, and Yamato deployed its navy to aid Baekje, in 660–663, against an invasion by Silla and Tang China (see battle of Baekgang). Numerous official missions of envoys, priests, and students were sent to China in the seventh century. Some remained twenty years or more; many of those who returned became prominent reformers. In a move greatly resented by the Chinese, Shotoku sought equality with the Chinese emperor by sending official correspondence addressed "From the Son of Heaven in the Land of the Rising Sun to the Son of Heaven of the Land of the Setting Sun." Shotoku's bold step set a precedent: Japan never again accepted a subordinate status in its relations with China. Although the missions continued the transformation of Japan through Chinese influences, the Korean influence on Japan declined despite the close connections that had existed during the early Kofun period. About twenty years after the deaths of Shōtoku (in A.D. 622), Soga Umako (in A.D. 626), and Empress Suiko (in A.D. 628), court intrigues over succession and the threat of a Chinese invasion led to a palace coup against the Soga oppression in A.D. 645. The revolt was led by Prince Naka and Nakatomi Kamatari, who seized control of the court from the Soga family and introduced the Taika Reform. 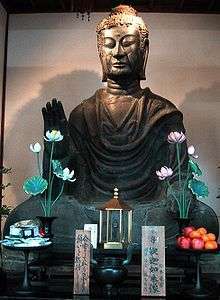 The introduction of Buddhism to Japan is attributed to the Baekje king Seong in 538, exposing Japan to a new body of religious doctrine. The Soga clan, a Japanese court family that rose to prominence with the ascension of the Emperor Kinmei about 531, favored the adoption of Buddhism and of governmental and cultural models based on Chinese Confucianism. But some at the Yamato court—such as the Nakatomi family, which was responsible for performing Shinto rituals at court, and the Mononobe, a military clan—were set on maintaining their prerogatives and resisted the alien religious influence of Buddhism. The Soga introduced Chinese-modeled fiscal policies, established the first national treasury, and considered the kingdoms of Korea as trade partners rather than as objects of territorial expansion. Acrimony continued between the Soga and the Nakatomi and Mononobe clans for more than a century, during which the Soga temporarily emerged ascendant. In the Taika Reform, the Funeral Simplification Edict was proclaimed, and the building of large kofun (tumuli) was banned. The edict also regulated size and shape of kofun by classes. As a result, later kofun, though much smaller, were distinguished by elaborate frescoes. Paintings and decorations in those kofun indicate the spread of Taoism and Buddhism in this period; the Takamatsuzuka Kofun and Kitora Kofun are notable for their wall paintings. The use of elaborate kofun tombs by the imperial family and other elite thus fell out of use amidst the rise of prevailing new Buddhist beliefs, which put greater emphasis on the transience of human life. Commoners and the elite in outlying regions, however, continued to use kofun until the late seventh century, and simpler but distinctive tombs continued in use throughout the following period. In 675 the use of livestock and the consumption of some wild animals (horse, cattle, dogs, monkeys, birds) was banned by Emperor Tenmu due to the influence of Buddhism. This ban was renewed throughout the Asuka period, but ended with the Heian period. The pest animals, deer and wild boar, were not affected by this ban. Taoism was also introduced during the Asuka period. In the mid-7th century, Empress Saimei built Danzan Shrine (談山神社, Danzan Jinja), a Taoist temple, at Mt. Tōnomine (多武峰, Tōnomine, "Tō Ridge, Tō Peak"). The octagonal shape of monarchs' tombs of this age and the celestial maps drawn in the Kitora and Takamatsuzuka kofun also reflect the Taoist cosmology. Tennō (天皇, "Emperor"), the new title of the Japanese monarch in this period, could also be argued to derive from the name of the supreme God of Taoism, the God of Polaris (天皇大帝, Tenkō Taitei). Taoist belief was eventually amalgamated with Shintō and Buddhism to establish new styles of rituals. Onmyōdō (陰陽道), a sort of Japanese geomancy and cosmology, is one of the fruits of these religious mixtures. While the Asuka period started with conflicts between clans over religious beliefs, later in the period, the imported religions became syncretized with Japan's native folk beliefs. Some architectural structures built in the period still remain today. Wooden buildings at Hōryū-ji, built in the seventh century, show some influence from Chinese and west Asian countries. For instance, the pillars at Hōryū-ji are similar to the pillars of the Parthenon of ancient Greece, as seen in their entasis. 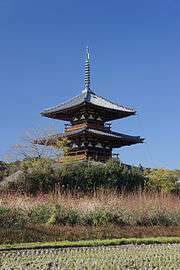 The five-storied pagoda (五重の塔, go-jū no tō) is a transformation from the Indian mound-like reliquary structure called a stupa. In addition, mural paintings in the Takamatsuzuka and Kitora kofun dating from the fifth century show strong influence from Tang dynasty and Goguryeo wall painting. 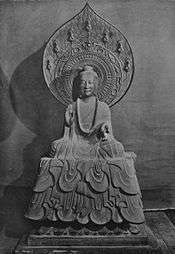 The Japanese Buddhist sculpture art of this period is believed to have followed the style of the Six Dynasties of China. The characteristics of the sculptures of this age are also referred to as Tori Style, taken from the name of prominent sculptor Kuratsukuri Tori, grandson of Chinese immigrant Shiba Tatto. Some of the characteristics of the style include marked, almond-shaped eyes, and symmetrically arranged folds in the clothing. The most striking and distinguishing feature of these sculptures is an expression of the smile that is called the "archaic smile". Kudara Kannon at Hōryū-ji is the most prominent Buddhist sculpture from this period. The second stage of Buddhist art, coming after the Asuka (cultural) period, is known as the Hakuhō culture (白鳳文化, Hakuhō Bunka), and is generally dated from the Taika Reform (646) until the moving of the capital to Nara in 710. During the latter half of the 8th century, a large number of songs and poems were composed and performed by various ranked people from warriors to the Emperor. The earliest collection of these poems is known as the Man'yōshū (万葉集, "collection of 10,000 leaves"). This includes works by several remarkable poets such as Princess Nukata and Kakinomoto no Hitomaro. Waka (和歌, "Japanese song") also emerged as a new form of poetry at this time. This term was coined to distinguish native styles from those imported from China; within the umbrella of waka poetry, one of the more popular forms is known as tanka (短歌, "short song"). It consists of a total of 31 Japanese syllables (morae) divided over five lines, in the syllabic pattern 5/7/5/7/7. 538: The Korean kingdom of Baekje dispatches a delegation to introduce Buddhism to the Japanese Emperor. 593: Prince Shōtoku is assigned as regent of Empress Suiko and promotes Buddhism with the Soga clan. 604: Prince Shōtoku issues a Chinese-style constitution (Seventeen-article constitution), based on Confucian principles, which de facto inaugurated the Japanese Empire. 645: Soga no Iruka and his father Emishi are killed in the Isshi Incident. Emperor Kōtoku ascends to the throne and strengthens imperial power over the aristocratic clans (see Taika Reform), turning their states into provinces. 663: The Japanese navy was defeated by the Silla-Tang alliance in Battle of Baekgang, failing to restore Baekje. 670: The first family registry (庚午年籍, Kōgo Nenjaku) was compiled. 672: Prince Ōama, later Emperor Tenmu usurped the throne by winning the Jinshin no Ran (壬申の乱) civil war against Emperor Kōbun. 689: The Asuka Kiyomihara Code was proclaimed. 701: The Taihō Code was proclaimed. 705: The Nishiyama Onsen Keiunkan is founded. It survives to become the oldest known hotel business still in operation, as of 2012. 708: The first Japanese coin (和同開珎, Wadōkaichin) was minted. ↑ Fred S. Kleiner, Christin J. Mamiya (2005). Gardner's art through the ages. Belmont, CA: Thomson/Wadsworth. p. 222. ISBN 0-534-64095-8. 1 2 3 4 5 6 7 8 9 10 11 12 L. Worden, Robert (1994). "Kofun and Asuka Periods, ca. A.D. 250-710". A Country Study: Japan. Federal Research Division, Library of Congress. Archived from the original on 6 April 2007. Retrieved 2007-04-06. ↑ L. Worden, Robert (1994). "Kamakura and Muromachi Periods, 1185–1573, Economic and Cultural Developments". A Country Study: Japan. Federal Research Division, Library of Congress. Archived from the original on 6 April 2007. Retrieved 2007-04-06. Yoshimitsu, in 1404, accepted the "King of Japan" title in his willingness to improve relations with China and to rid Japan of the wako threat, thus establishing trade with China. This was considered as tribute by the Chinese but the Japanese saw it as profitable trade. This relationship lasted for about 50 years. (see also Sinocentrism). ↑ general editors, John W. Hall... [; et al. (1988). The Cambridge history of Japan. Cambridge, UK: Cambridge University Press. pp. 182–183. ISBN 0-521-22352-0. ↑ Web Japan, sponsored by the Ministry of Foreign Affairs, Japan. "One hundred years older than supposed? 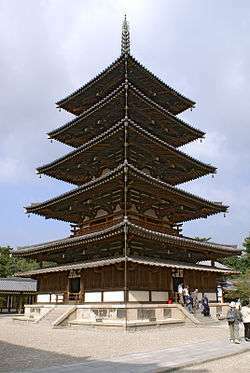 : World Heritage Pagoda". Retrieved 2007-04-04. ↑ Farris, William Wayne (1998). Sacred Texts and Buried Treasures: Issues on the Historical Archaeology of Ancient Japan. University of Hawaii Press. p. 95. ISBN 978-0-8248-2030-5. ↑ Kurashige, Taku; Rie Yamada (2003). "Asuka Period".